Sandy All but Gone, What's Next? Sandy gave Eastern MA, NH, and ME one more punch last night. A micro burst was reported in Wareham, MA leaving thousand without power. Latest updates are that 55 people have died in the United States with an additional 50 + in the Caribbean. However Sandy is going to be out of our hairs soon. The only lingering effects will be isolated showers Wednesday and into Thursday. So lets move past Sandy and into the week ahead. For a meteorologist it's very boring after all the action last week. Most areas of New England stay dry with exception being Maine. Skies will be a mix of sun and clouds high 56. Best chance for an additional shower tonight. Low 43. Mostly Cloudy early, partly cloudy later high 54. Cloudy, slight chance of shower (~10 percent) low 39. Things will cool off this weekend. Skies will be partly cloudy Saturday with a high of 49. Saturday night will be clearing, allowing temperatures to drop into the lower 30's. Thus the rebound of Sunday will only be to 47. Skies will be clear. Clear and cool Monday, potential to see some snowflakes on Tuesday. Have a good Halloween, I can't believe tomorrow is November. The worst impacts may have spared the majority of New England but all one has to do is turn on the news to see the devastation that occurred in the Tri-State region. New England dodged a direct hit, but the indirect hit from Sandy was still enough to cause 300,000 + customers to lose power in MA alone. Reports of almost 1 million New England customers are without power. Here is a list of wind damage reports from yesterday. 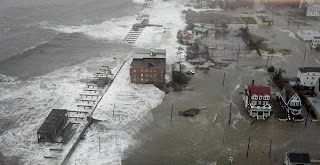 Also the south New England shore was rocked by storm surge. I haven't heard any updates from CT since last night when a Category 4 evacuation (the highest threat) was issued for coastal residents. 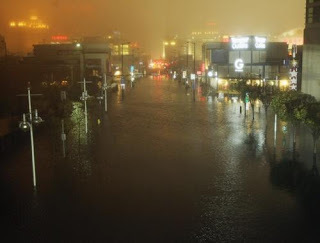 Atlantic City was completely flooded; the boardwalk was washing down the street. Rainfall is streaming into Southern New England off the Atlantic. Thunderstorms are ongoing in Northern New England. Some of these rain bands could briefly take on Severe Thunderstorm Characteristics. The Storm Prediction Center has issued a discussion warning there is a 40% chance New England goes under a Severe Thunderstorm Watch. Bottom line some of these rain bands will be intense. These won't be extremely damaging storms, but some branches could come down in the heaviest rain bands as winds above the surface are running about 55-60 mph. An isolated tornado cannot be ruled out especially near the coast. Rotating storm bands meet the shoreline where there is friction and that causes tornadoes. 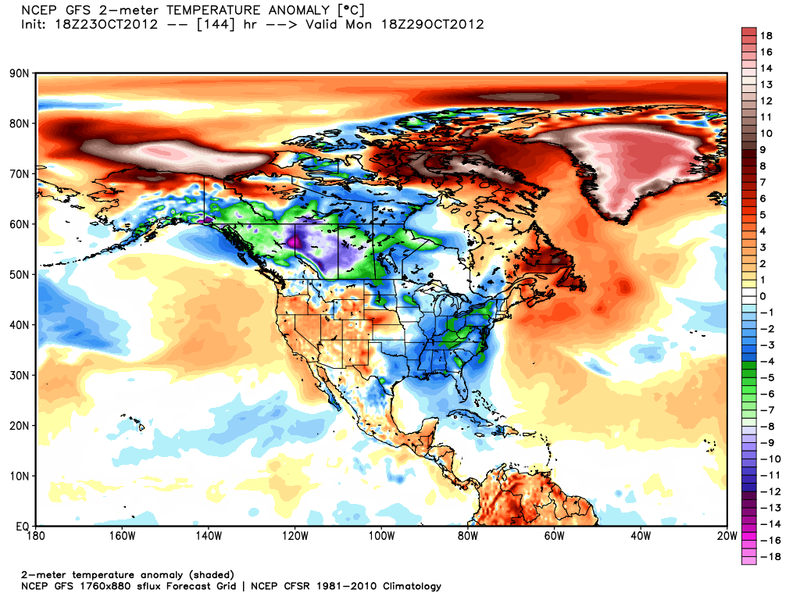 For some good news Friday through next week look to be seasonably mild, something we certainly will take in November. By the way, 2-4 feet of snow are falling in West Virginia. May not see an event like this in our lifetimes. There will be worse storms for New England. I can't say the same for New Jersey and New York. There will be no Hurricane or Tropical Storm warning's for the northeast due to Sandy's transition into a Nor'Easter on steroids. Once again we have to play mental games with a Hurricane because people here its a "weak category 1" and let their guard down. First of all we don't get Category 1's in the northeast often. Second of all the pressure in Sandy has dropped to 946 mb, consistent with a Category 3 Hurricane. Sandy will not have a powerful core of winds around the center like a purely tropical system would. Instead the wind field is incredibly large and so everyone feels the effects of the storm for over 24 hours. A lashing like this will strip the trees that aren't knocked down and so our landscape will look like early December. Here is a timeline of what to expect, where, and when. The heaviest winds will occur during this period. In Southern New England we will get a strong band of winds by noon time lasting through the night. Hurricane force gusts will be likely when the rain bands begin to move in around 4 or 5 PM. It is during this period the majority of trees and powerlines will fall down. For coastal residents the surge and waves are already inundating the coastline well away from the center. The high tide this afternoon will be bad; the high tide tonight will be awful. I expect serious flooding from Chatham to Delaware Bay. Surge amounts may be to low. Tropical Storm force wind gusts continue well into tomorrow. Expect wind gusts to 60 mph all the way to Detroit and Toronto. See my other posts for graphics on this storm. We were able to lock into a track on Saturday and we are right on track. 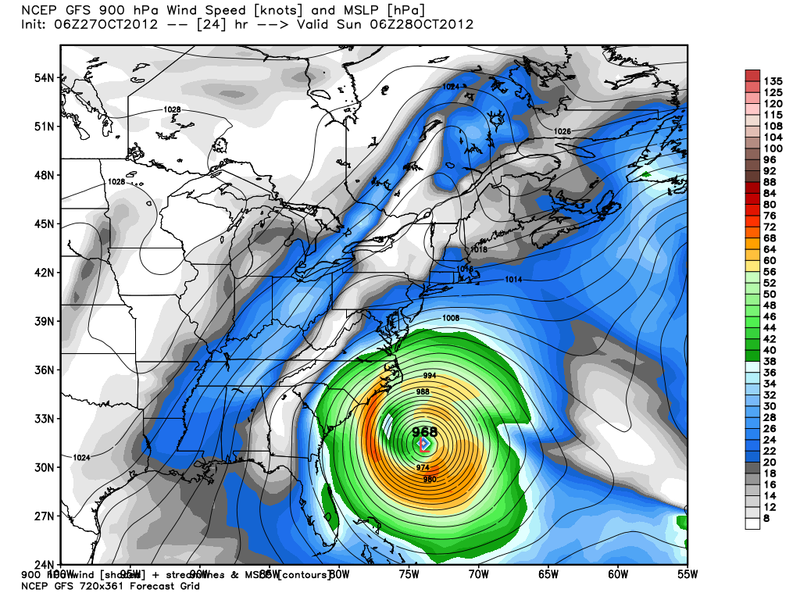 The pressure in this image is already incorrect- it shows 952 while Sandy is already down to 946 and falling. The bands that will be affected Southern New England will not occur until this afternoon. It is surprising some of the wind gusts reported thus far without any convection. For example here is the predicted radar for today at 3 PM. We will be around 984 mb at this time, with 72 (kt) winds above. When that convection taps those winds I expect wind gusts over 60 mph. The closer to the coast the more likely these are to be 70 mph. It is now likely that bands of showers and thunderstorms will continue to rotate onshore through tomorrow. It will take a long time for power restoration efforts to begin. Very concerned for the Mid Atlantic today as well as the Cape and coastal MA/RI. Looking at the data this morning the surge along the eastern MA coast will be worse than forecast. 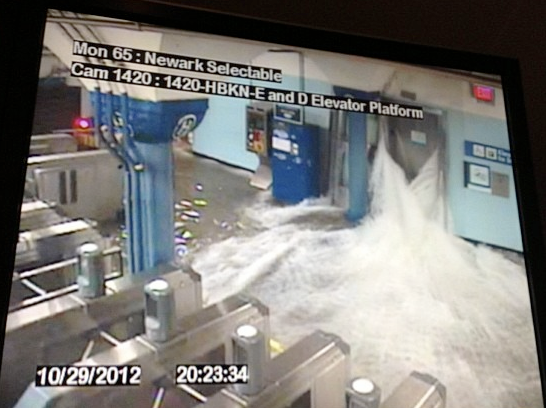 The waves on top of the surge will be many communities undoing from Sandy. If you have been watching The Weather Channel for coverage of Hurricane Sandy, you may have noticed the two different computer models they keep showing. 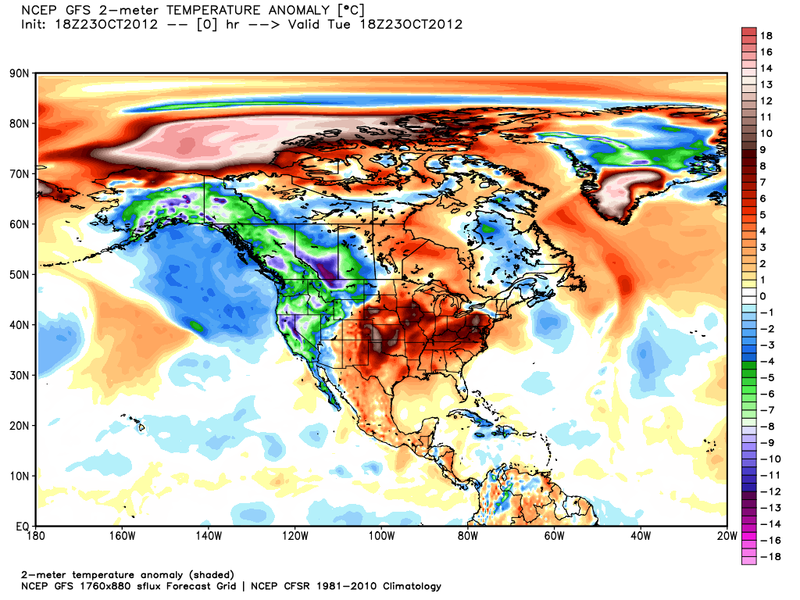 These two models, the EURO and GFS, are just two of many solutions meteorologists use to forecast the weather. 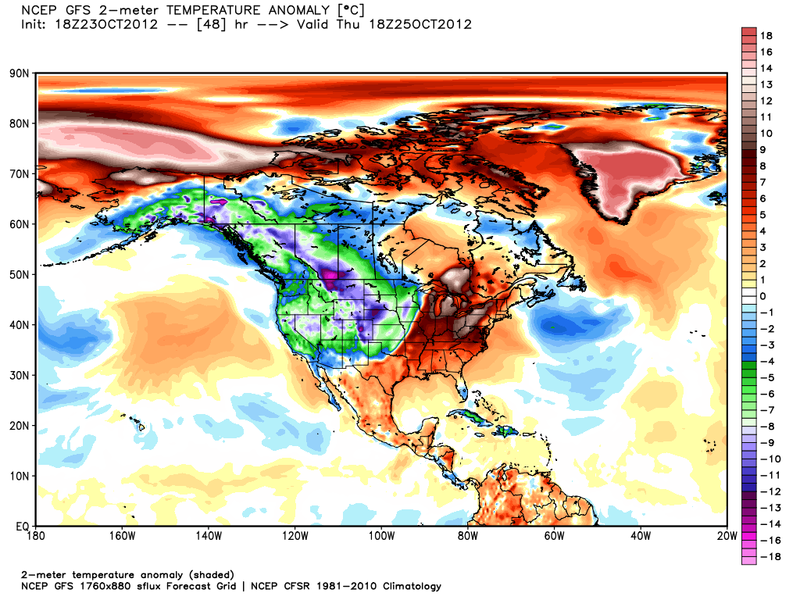 However the EURO and GFS are two medium range global models and over time have proven to be the best. 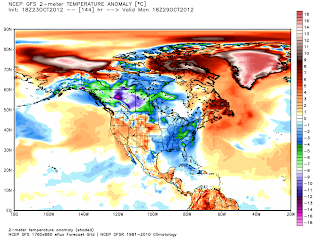 The EURO is run by the European Centre for Medium-Range Forecast (ECMWF) and is usually the most reliable model. 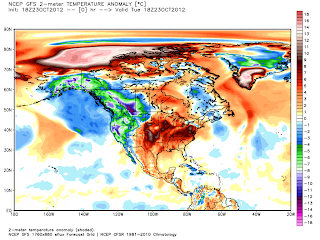 The GFS is an American model run by the National Center for Environmental Prediction (NCEP). Weather models solve the known equations that govern atmospheric physics. It is for that reason meteorologists study years of calculus and physics in school. Thank god we developed computer models to solve these equations. The models use data collected by upper air measures (balloon launches, satellite data, observed data) to input into these equations to start the process. These measurements are usually taken twice a day, at 8 NAM/PM during Daylight Savings time and at 7 AM/PM when it ends. They run on Coordinated Universal Time (UTC) which begins at 00z at midnight on the Prime Meridian (0 degrees longitude, border West/East Hemisphere) . This is done so all balloon launches are done at the same time. In a rare move the government ordered balloon measurements 4 times a day until Sandy passes. This is an impressive step by the government and shows they are taking the storm very serious. Now on to the weather. I've zeroed in a New Jersey impact. 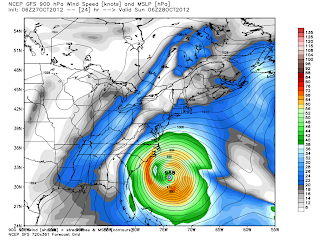 I am going to support a northern NJ landfall although that doesn't change the forecast for New England all that much. I apologize in advance for the length of this post; I promise that when the weather is normal I will be much more brief. Here is the National Hurricane Center forecast track and cone of uncertainty. This is useful to determine who exactly gets the highest winds, but it really does not matter. I am slightly closer to the GFS model as I have a hard time believing a storm of this size can make a left hook into the Delmarva as the EURO depicts. I've set the line for severe New England impacts at 40 degrees North latitude. If it comes in above we see a storm unlike any in recent times. For my parents generation it almost seems like the Hurricane version of the Blizzard of 1978. Sandy is rather ugly looking this morning but her wind field is huge. The predicted rainfall, which for Southern New England is almost an afterthought with the winds we are going to experience. Anything that falls in this period are from the extreme outer feeder bands of the Hurricane (note I will be calling this a Hurricane even though it is going to be a hybrid Nor'Easter/Hurricane). The real rain from the storm's core will roll in Monday Morning between 8 and 11 am. Typically the highest winds are on the northeast side of a system while the heaviest rains are on the west. If anyone remembers Hurricane Irene last year knocked power out to a lot of MA/RI/CT residents, but caused severe flooding in NJ, NY, and VT. These rainfall forecasts are provided by the Hydrometeorological Prediction Center (HPC). Of course while all this is going on along the Mid Atlantic coast and New England, a snowstorm will be raging on the backside. I will not focus on the snow, but will mention it because there has been only a handful of storms like this in the modern era. If you are a fan of the weather and would like to read more about similar storms throughout history I recommend looking up on Hurricane Hazel, Great Hurricane of 1938 , Gale of 1878, and October 1804 Snow Hurricane. A long duration of onshore winds will force significant storm surge into the the beaches of Long Island, Northern New Jersey and Southern New England. Even Northern New England will see moderate water rises. Waves offshore are forecast to on the order of 40 feet. Throw in a high tide and coastal residents have a disaster on their hands. There is a Weather Channel program called "It Could Happen Tomorrow" on New York City being hit from the Southeast by a major Hurricane. This system might be as close as it gets to that scenario. There is a full moon so tides will already be 20% higher. Even worse is that the October full moon (Harvest Moon) has the strongest effect on tides. Coastal communities must seriously consider evacuations. If you live on Cape Cod and want to leave do so ASAP. By 2 am winds are beginning to pick up along the east coast. This is about 5000 feet up in the atmosphere. All it will take is a some convection (showers, thunderstorms) to bring these to the surface. 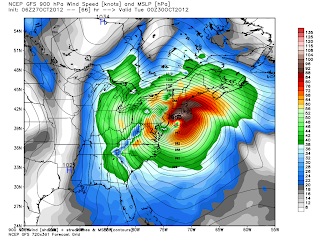 The EURO model at the same time, but at 850 mb instead of 900 mb. Very similar set up. Look at the size of this storm. This is a devastating blow Monday afternoon and evening. 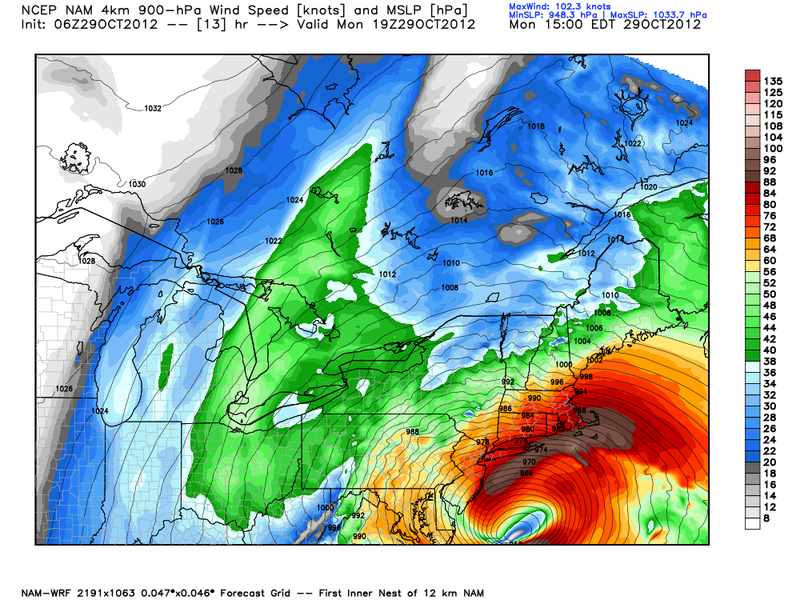 Wind gusts would be over 100 mph for most of southern New England (areas in grayish color), especially coastal regions. Sustained winds would likely be near 65-70 mph. Further inland 50-60 mph with gusts to 80. 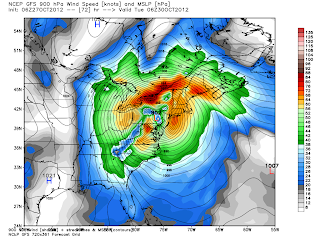 The EURO has the heaviest winds over NYC, NJ, LI. Awful scenario for these regions. Yet we still see gusts to 85-90 mph in this scenario. 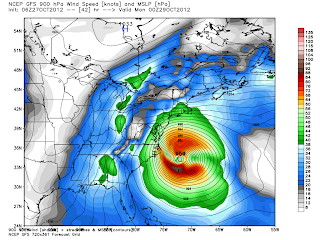 Again this is stronger than Irene by a longshot. Also will affect many more people. Finally GFS Tuesday at 2 am. Look at the US/Canadian border. This would rival Hazel in those areas. 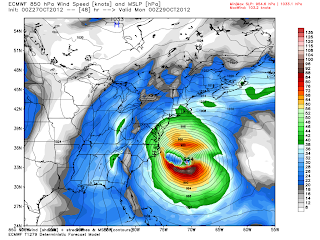 I do not think Sandy will weaken quickly once inland like most tropical cyclones. She is not going to be a pure tropical cyclone, she will be supported by the jet and infused with Pacific stream energy. This is why I have been a bit "dire" or perhaps over the top in covering Sandy. I'd rather hype this storm and have it be a dud than allow people to be under prepared. 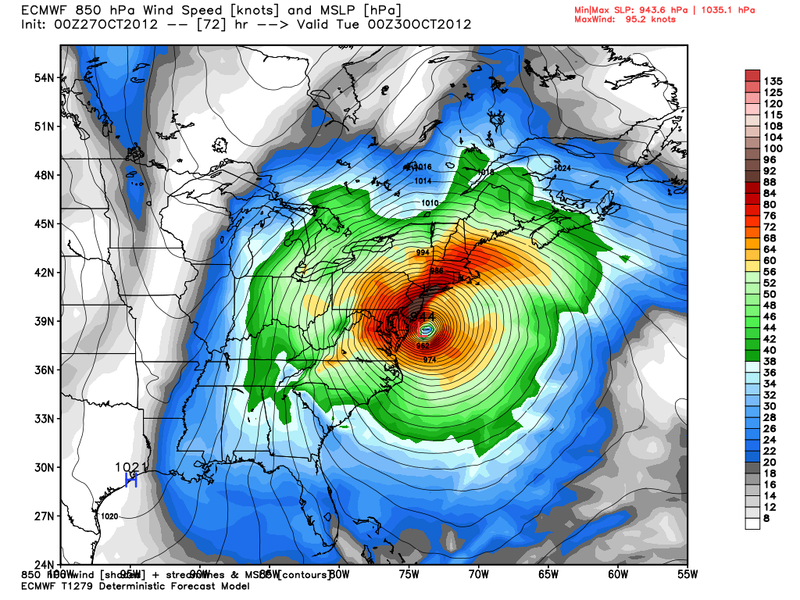 Tuesday will still be windy as its unknown how exactly Sandy reacts once over land. Some model guidance suggest a loop over NY state and then back out to sea. We can fine tune that later today or tomorrow. Folks I expect power to be out for a significant period of time. The stores will be mobbed today but get what you need. Take loose furniture inside, tie down anything you do not want to blow away. If you sleep in a bedroom in which a large tree could fall on, move to a safer place in the house. I think thats all. Any questions leave a comment here, on facebook, or tweet me @zgreenwx. Thank you for your time. Here is my blog on tornadotitans.com, whom I work for part time. 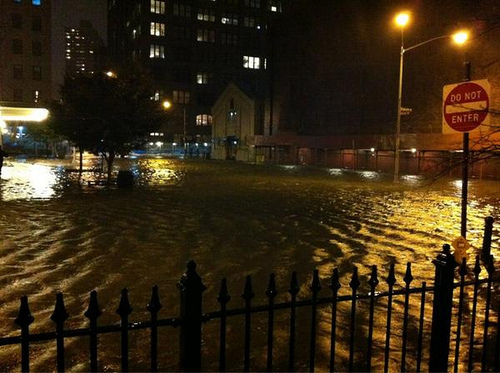 Hurricane Sandy rapidly gained strength last and also made a second landfall over Eastern Cuba. Winds were sustained at 110 MPH and the Barometric Pressure was 957 mb (28.26 in). So far the forecast is on track. It will not be until later tonight or tomorrow before the track will lock in. There is still some divergence from global weather models but they all are capturing the same basic pattern evolution. 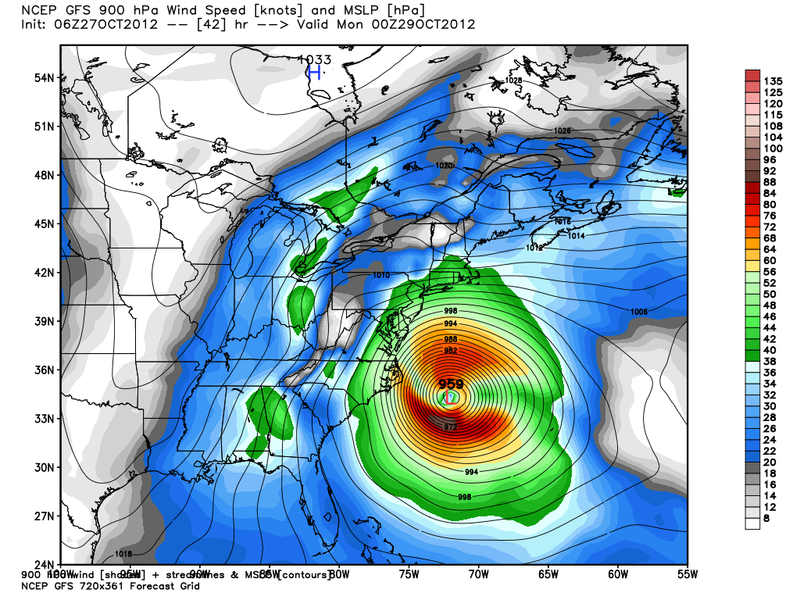 The block over the Atlantic will not allow Sandy to escape out to sea without some sort impact in the Northeast. First lets start with the National Hurricane Center forecast and cone of uncertainty. The environment in front of Sandy is favorable for strengthening, although it may not be reflected in the maximum wind speed. 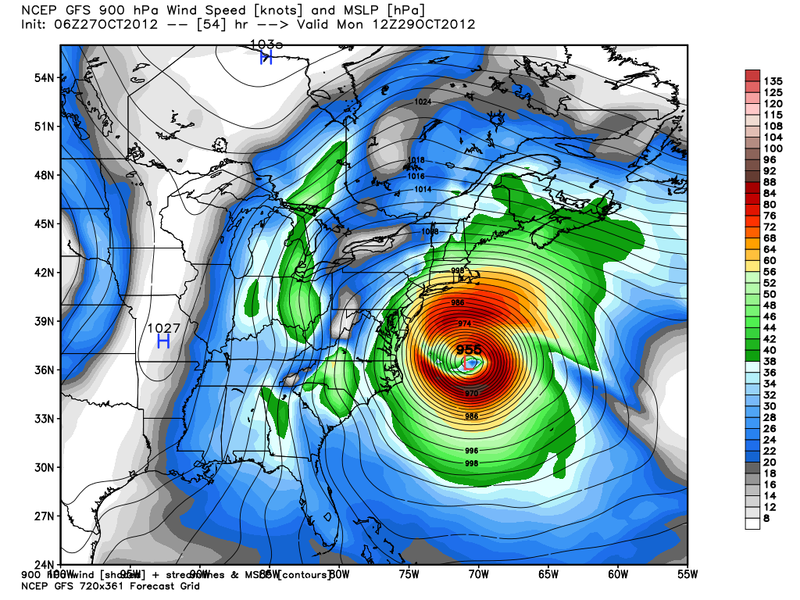 Instead it is more likely that Sandy spreads its wind field out several hundred miles. For a densely populated region like the Mid Atlantic and New England this is not a good thing. The widespread wind field will send an intense storm surge onshore for several days. There is also a full moon on Monday which means tides will already be higher regardless of whether Sandy roars in or not (it will in some form). Here is Sandy are a few satellite images of Sandy. So why is it that this system cannot escape out to sea? The atmosphere behaves as a fluid. Imagine a rock in a river. It "blocks" the water from taking a straight path so the river diverts around the rock (or any barrier). In this case the atmosphere is blocked by High pressure near Greenland. The high pressure sets up a large ridge in the Atlantic. Meanwhile, a strong cold front is marching east from the Midwest. Sandy is moving to north in between these two systems at the moment. The block won't move; in fact the latest NAO forecast is negative for the duration of the forecast period. In a negative NAO high pressure is dominant near Greenland and thus the block will not break down. So that leaves the cold front to capture Sandy. The trough digging in the Midwest and Great Lakes is very strong. This will allow the trough to take a "negative" tilt. Here is the North American Model 500 mb (mid level of atmosphere pressure decreases with height. Surface is around 1015 mb). The blue line indicates the negative tilt. Sandy is likely to try and turn out to the northeast, but will be caught by this trough and will resume a NW and eventually WNW track. The question is rapidly becoming not if we get hit, but how bad we get hit. 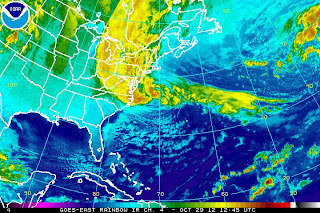 Since I do not believe Sandy can escape out to sea, the question is whether the storm makes a direct hit on Southern New England or the Mid Atlantic. I lean towards New England because it will be hard for any system to bend into the Mid Atlantic this big and strong. Although New York City is a compromise it frightens me to think what a warm tropical system, transitioning to extra-tropical all while interacting with an Arctic front could do to New England and NYC with a direct hit. I will leave everyone with the HPC 6 day forecast. After today if the trends hold impact maps and timing will be drawn up. I'll have a post on www.tornadotitans.com tomorrow which I will link here. 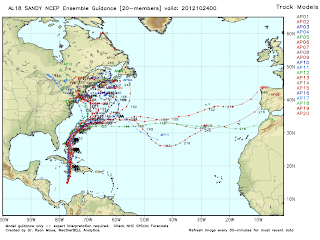 After reviewing the overnight computer model data there isn't much to add for Tropical Storm Sandy. Sandy will become a Hurricane today before striking Jamaica and then Cuba. The interaction with Cuba will not take as great a toll on Sandy as it has on previous cyclones due to a S-N movement, rather than WNW along the island. That still leaves us in the Bahama's with a Hurricane tomorrow night. Very impressed with the energy Sandy has to work with and its slow organization. Here is Sandy on the water vapor this morning. All of this energy will interact with a cold front moving east in the day 5-6 range. Even if Sandy escapes out to sea a Nor'Easter will develop along the coast and would be intense. I'm not a forecaster that likes to change with every model run, however guidance has slowly trended to a Northeast landfall of Sandy. 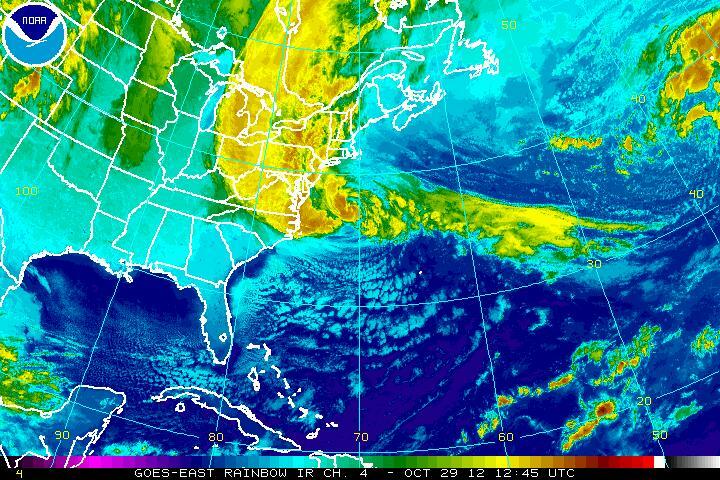 The entire Eastern Seaboard will feel the affects of Sandy. South Florida has just been placed under a Tropical Storm Watch as Sandy will have such a large circulation. A loaded Tropical system interacting with a cold arctic air mass with a block near Greenland...wild times in the weather world. 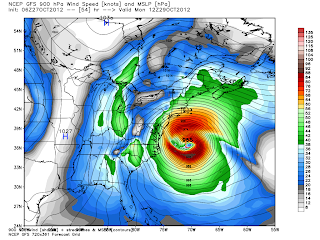 Best advice is to have a plan ready in the growing likelihood Sandy slams into the Northeast. Finally while the American model insists on an out to sea track (though it wants to develop a coastal low; it just doesn't show it yet) many of its ensemble members (same physics, slightly different initial conditions) shows most members re curving back into New England. This is a trend west so we'll see if it continues. We'll get a warm up Friday and Saturday with temps near 70. This may linger into Sunday. In the near term today is Mostly cloudy with a high around 60. Showers and fog will burn off slowly. Northern MA and points north will see the most sun today. Tomorrow is mostly sunny for the majority of region. Next rain chance is with Sandy/Sandy's daughter. I wonder if the Weather Channel is going to name Sandy's snowstorm. That's right while New England gets whipped with heavy rain and wind other portions of the Northeast (western NY, PA, WV) will be having a raging snowstorm. The meteorology world has been buzzing about a potential storm system impacting the northeast next Monday, Tuesday, and Wednesday. Most forecasters have tried to hold off issuing any dire announcements or declarations about this system because it is just too early to be sure of any specifics. However there has been too much consistency from some of our weather models and quite frankly the solutions of several of these models are downright scary. Rather than alarm anyone I feel tonight is a good time to tell the public what may be coming so we can keep an eye on it. Here is a breakdown that will be somewhat technical but this will be the first of potentially many blogs on this system. Up until Friday at 2 PM most of the computer guidance is in remarkable agreement about this. In fact, there is roughly a 90% chance that Sandy is a hurricane in the Bahama's on Thursday evening. 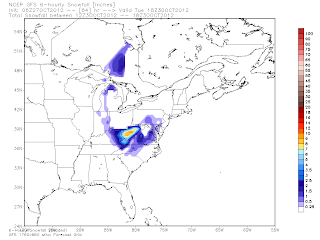 For my meteorology friends here are the relative measure of predictability from the 00z/23 model suite. For causal readers I hope you will be able to read this chart. The ridge over the east is highly predicted; the diving trough is in the Midwest is not. 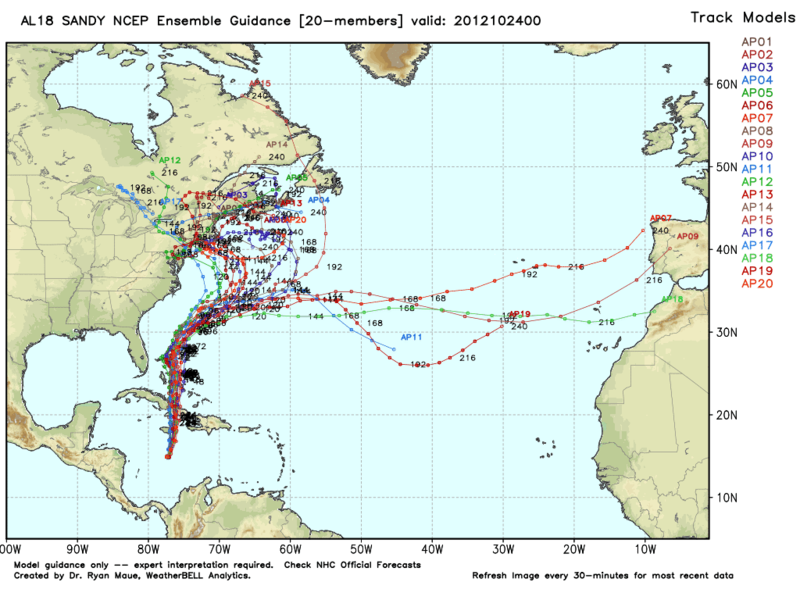 In terms of the computer models some of the global guidance (NOGAPS, EURO) and ensembles (EURO, GFS) are indicating that Sandy will try to come north and not escape out to sea, which is favored for October tropical cyclones. However a developing atmospheric block will eject the system to the northwest. There is also a very cold air mass diving south into the Midwest and southeast from Canada. 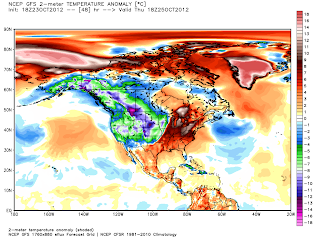 Here is the 18/23 GFS 2 m temperature anomaly charts courtesy of Dr. Ryan Maue of weatherbell.com at several points in the next week to illustrate the coming cold. Note that anomaly charts measure the departure from average so negative anomalies are colder than average and vice versa. This is a major temperature clash so there is already a strong baroclinic zone forecast, with or without a tropical system. A big question is how "deep" the trough will dig into the south. A friend of mine who works for the National Weather Service down south noted that there have been some unusually strong trough's that have dug deep this year. The deeper the trough the more likely it is Sandy is captured and ejected into New England. Related to the trough is a developing block in the Atlantic Ocean. This "omega" block will not allow Sandy to escape out to sea. Some models do not have this block being as strong and thus allow the system to meander further out to sea. However the American Global Forecast System model (GFS) has the system eventually finding its way back towards Southern New England. From a synoptic and physical standpoint I cannot see Sandy escaping out to sea. I will not predict strength or impacts this early, nor will I pick a model . Track is important but this will be a large system. For my meteorology friends I am leaning towards a hybrid of Sandy impacting the Northeast early next week. Hopefully the EURO is wrong. It means its time to make an emergency plan. Make sure you have working flashlights, batteries, radio's, water, non perishable foods. Clear the gutters of leaves on roofs. If you live near the coast and make preparations for winter storms its a good time to think about when to secure property. This could be all hype; if that's the case no lives will be lost. This also could be the real deal, a storm of this magnitude hasn't occurred in generations. For what its worth here is the seven day forecast from the Hydrometeorological Prediction Center (HPC), one of the best government meteorological agencies. Updates will be made each day. Questions comments tweet me @zgreenwx .